Baglietto is one of the most prestigious names of the entire Italian shipbuilding industry. It's had some difficult business experiences in the past which threatened its very survival, but it resumed operations again six years ago, dedicating itself exclusively to an elite international production and clientele. It is part of that circle of businesses that make their contribution to the country's economy in silence, but with great effectiveness, basing its activity first of all on the professionalism of managers, employees and collaborators, and on the quality and reliability of the items produced; its intention is to make way in the world market for large pleasure boats in aluminium and steel. We here present a shortened version of an extremely interesting conversation which began by talking about this excellent moment for the megayacht sector. If four, five years ago we had a good image at an international level, now this credibility is at a height. If, before, we had a production of megayachts close to that of the United States, this year, based on Ucina figures, we find ourselves producing 170 large boats against their 100. How has it been possible, in your opinion, to achieve such a good result in the market? Today's result is the fruit of many years' work. Contrary to what is commonly thought, the United States' market is very suspicious and cautious. It's sceptical about accepting objects, vehicles, boats, anything that they don't know well and is not American. Then, with the passing of time, they have realised that Italian quality was in no way inferior to the quality found in North European countries - Dutch boatyards are still considered as "the top" - and now they are also buying our boats. The skill of our craftsmen, within a productive process, has astonished them, but perhaps the most important aspect is that we have finally gained credibility. The number of companies that work seriously, that respect the agreed standards of finishing, but especially the delivery dates, have increased in Italy. This was not so in the past. One of the greatest Italian weaknesses in the past was in fact the failure to respect delivery terms. Except for some very rare exceptions, price is always an influence. I've never met owners of boats and especially of large yachts that have not negotiated over price. I've been in this sector for thirty years - twelve in Picchiotti, another twelve with Codecasa and six with Baglietto - and I've never seen so much asked and so much given. Impossible. There's always a negotiation. On the other hand it's in people's nature, in the spirit of these people, which in 90% of cases are businessmen, financiers, industrialists. When you talk of boats that cost tens of billions of lire, it's only big business and not even show-business people, except for smaller boats. And the American market has an extremely rich business class, the likes of which we dream about. The dimensions of their companies, and therefore the level of wealth, are such as to allow them to consider buying a megayacht without any problem. The price, however, remains fundamental, because all the wealthy people in the world are the same from this point of view: they live in fear of being cheated, swindled. Therefore, the greatest problem for a rich American is to understand if what is being asked corresponds to the real value of what he's about to buy. The fashion and prestigious car markets have given us a hand in refuting the negative image of the past. Yes, fortunately. Very much. Now what is Italian is beautiful, and what is beautiful is worth buying. How much of Baglietto's production is absorbed by the North American market? In six years we have built 11 boats, of which the smallest is a 28-metre boat. We have sold two in that area up to now. Baglietto, moreover, is a name that has always sold and sells very well in Europe. It's a consolidated name both for the quality of the product and for the type of boat. In taking over the company, we have therefore simply tried to adapt aesthetic designs to current tastes and the architect Paszkowski has done a great job, because he's created new designs but which still recall the Baglietto design and style. We leave the buyer a free choice as to how the interiors are fitted out, but for the design, every boat of ours must remain a Baglietto; people must be able to recognise it as a Baglietto. On the other hand, we still use the original technical design, because we have realised that in the market, especially with regards to aluminium boats, nobody has offered anything better in these years. Our boats still go faster and conserve better than the others, so it's right to continue to make them in this way. 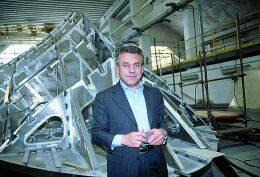 When we took over in Baglietto, we chose to work on a limited and high level production. 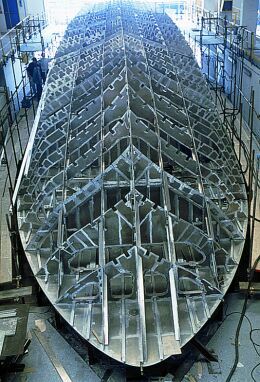 We have the ambition, sometime in the future, of competing with the Dutch boatyards, our main competitors in aluminium, but even if they work well and are well known, their product is old. Has sticking to tradition helped the return of old Baglietto customers? This was what I wanted to emphasise. Last year we delivered a boat to an old customer, who had waited three years before approaching us again, to see how the new management worked. When he saw that while this management was attentive to the accounts, it still continued the boatyard's tradition, he ordered a new boat from us, the eighth Baglietto in its pleasure boat activity. This is not all. He also brought us another customer, his compatriot, to whom he pointed out the quality of our product, how we deliver what we promise and he became the second American buyer during our management. But do you also sell on the Italian market? We have a large Italian market, which is constantly growing. This is our jewel in the crown because the Italian is usually the most demanding customer of all and if he comes to us, this means that Baglietto has re- entered the market with full rights. We are working very well in this area. We work without exclusive dealers who have always been disappointing in our experience, but we are open to everything, even if our best salesmen today are our customers, such as the American we talked about before. What is your production direction today? With the Baglietto type of boat, style and philosophy unchanged, we have also extended our market into the megayacht sector, adapting to current trends. Will you also build open hulls? There's a significant demand for open hulls, therefore we have also designed and perfected one, again in aluminium, a boat of 30 metres that with a suitable motorization reaches a significant speed: 45 knots. And instead, between 20 and 30 metres? We're not interested in this sector. There's an invasion of yards that build well in fibreglass up to 30 metres and they also make enjoyable, beautiful boats... For boats up to those dimensions, unless someone specifically wants a Baglietto of 28 metres, they hold the market. And what's more, they manage to make a high number of boats. For example, to build the structural part of a boat of 30 or 33 metres, we need between seven and eight months; in contrast, the mould for a 30 metre fibreglass boat is produced in two and a half months or three. In 90% of cases, for such dimensions, aluminium is not considered. Our materials have a higher cost, but on the other hand, clearly better flexibility. It's easier, therefore, to adapt them to subsequent requests from the customer, such as a metre longer or shorter, moving the bulkheads, modifying the structural base of the interiors, the installation of different motors, etc. On an aluminium boat, everything is easier. There's no mould, but everything's more flexible. .. In addition, when buying boats of a certain dimension, many customers want products of a very high level and it's undeniable that today we can work with splendid aluminium alloys and very high quality steels. I'll give you an example to understand the difference immediately. One of our 38-metre boats, last year crashed into a ferry at Palma de Majorca. It lost six metres of bow, but it remained afloat and nobody was harmed. This is because in an accident aluminium deforms to such an extent as to absorb the impact, while the fibreglass boat would have been smashed. With repair work we lengthened the 38-metre boat to 40 metres. It's now perfect as new. Many things are possible with aluminium. What problems are there in working with aluminium? The problems are linked exclusively to the personnel, who must have great specific experience and high professionalism, because it's a material that must be treated, prepared, shaped and welded in a certain way. The greatest development has been the introduction of information technology in the working process. At one time, in fact, the boats were designed in the tracing room, where the outline was prepared on a 1:1 scale. The outlines were then passed to the production phase and the man cut all the boat's structures mechanically. Today, instead, the construction design is done with the computer, which elaborates all the structural part of the boat and with CAD programmes, and not only perfectly calculates all the necessary surfaces, but also how they must be cut; these elaborations are then sent to specialised companies that use numerical control machines that water-cut and which supply perfect pieces without burrs or deformations. The structures that arrive at the yard are therefore perfect, cut with exceptional precision, to around half a millimetre. As a result, there are no burrs on the cut parts nor, as once used to happen when cutting at heat, deformed pieces. In practice a puzzle is created electronically through these programmes, which the professional skill of welders and carpenters then put together. There's a greater degree of design, which means starting a month later, but we finish two months sooner. In conclusion, it doesn't only speed up production times, but considerably improves the quality of the product. What other advantages does constructing in aluminium bring? Lightness and, as mentioned above, safety. An aluminium boat, of the same dimensions, is always lighter - I would say 5, 8 and sometimes 10% lighter - than a fibreglass boat. This gives us two advantages: a greater speed with the same motors, or the same speed with less powerful motors, and also has a cost effect, on fuel consumption, on the boat's range. Our aluminium semi-displaced 41-metre boat does 30 knots; the same boat in steel does 16 knots. They are identical but there is a difference of 100 tonnes between them. Moreover, the steel version is an ocean-going boat with a range of 5,000 miles, while the other does 30 knots with a reduced range of 2,000 miles. But are the processing costs higher? Much higher, because with fibreglass, once the mould is made, a boat can be produced every three months and the design costs depreciate over the whole series. With aluminium there's more flexibility but this possibility in the end makes every boat completely different from another. To do the same thing with a fibreglass series the moulds would not be reusable and it would be necessary to make them from scratch. Do customers understand these advantages? From a certain dimension upward, that is from thirty metres. Then the customer begins to take aluminium into consideration. Does painting aluminium present problems? No, today there are products for painting aluminium that last even 4 years, unless they need special finishings, etc. Then, you will need to give a touching up. Certainly, the aluminium boat needs a bit more care, but it's always a reparable, high technology structure. And I see that when customers start out with the first they never turn back to other materials. You obviously follow developments in design and technology. In what direction are you moving? We are following possible development in bottoms very closely. It's a difficult sector, where no one has ever invented anything truly new, even if new bottoms have been created for workboats and fast ferries, but the results will only really be seen over time. With regards to military vessels, development is zero, while there has been some development in the field of new motors and componentry engineering. What type of propulsion do you prefer? We make boats with both traditional propulsion, with a propeller, and with hydrojet propulsion. For the greater speeds we prefer hydrojet to surface propellers, because in boats of our dimensions the hydrojet offers a clearly greater efficiency, even though it costs a lot, it's delicate and there are advantages but also disadvantages in its use: it allows you to arrive at the shore with the boat without touching with the propellers, but doesn't permit you to choose the velocity at which to travel. In other words, the hydrojet is essentially a pump that has very precise outputs at defined speeds. Under these speeds, it consumes the same fuel with an efficiency of 70% less, therefore whoever chooses hydrojet must have clear ideas on how to use it. The manoeuvrability of a hydrojet boat is 50% better than a boat with propellers. You just need to know how to control it. I know skippers who are on our boats, who do things with a hydrojet that would be completely unthinkable with propellers. Another type of propulsion that we use on the largest, displacing boats, is a propeller system with blades that can be oriented, the same used for ships. They are not fast propellers, but they make it possible to change the pitch of the propeller depending on the speed of navigation that you want to maintain. In practice they allow for the most efficient use of the propeller. How are you organised for after-sales assistance, and in particular, how do you assist the two vessels sold to the Americans? First of all, we try to avoid the need for assistance, to avoid having to take any intervening action. And I must say that we have had no substantial problems. The first boats launched three years ago are all in use and we have taken action, as per our contractual obligation in the warranty periods, in the sense that once the cruise has finished we carry out a check under warranty, looking over everything. But, apart from this, there have been no real problems: this is also thanks to the experience gained by master craftsmen and managers over many years. We know how things should be done and we try our best to do them right from the start. Certainly we have higher costs, but this construction philosophy pays in after-sales, because we don't have to take action very often. For the USA, we are studying how to organise ourselves. If we need service station, we will certainly make an agreement with someone there. For the moment, this necessity has not yet arisen. How many boats do you currently manage to produce in a year? At the moment we manage to construct four boats a year at the same time, but we are counting on arriving at at least six: three at Varazze and three at La Spezia, where we have built and delivered even a forty-five metre boat, which would have been impossible to deliver here, at Varazze. Ferretti, Azimut, Sanlorenzo, Perini, Baglietto: all are locating themselves in the magnificent La Spezia anchorage. How do you explain this concentration? Because at a local level they have demonstrated great attention and sensitivity towards pleasure navigation with facts. La Spezia, as is well known, has always worked a lot in civil and military shipping, but in the last few years these areas have suffered a terrible drop in employment, more than 10,000 jobs lost. The boating industry was a compulsory solution. It just requires converting the people who worked in the shipping industry to yachting, and this is what we're doing with training courses, in association with the region and the province, and I see that they are beginning to produce results. Do you therefore intend to further develop your base here? Certainly. We have built two telescopic sheds, which move on rails, both 50 metres long: we moved in in November 1999, and we have been working in these sheds already for a year and a half. In other words, they gave us the permit in three months. 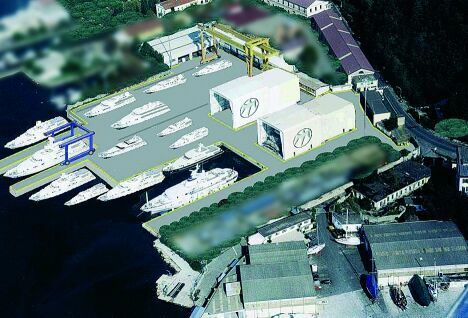 I submitted the project for restructuring the boatyard at the end of the year and I already have the approval of the services Association, which will soon give approval to build a travel lift of 720 tonnes, which will be the largest machine of this type in Europe. We also have the advantage of having a very large square, which helps us in moving the boats. And we intend to also work in refitting. At the moment, most of the repairs of large boats are carried out in Spain, at Palma de Majorca. With regards to La Spezia, we are geographically placed in a fantastic zone, central for Italy and easily accessible from Milan, Genova and Pisa airports. From a logistics point of view, we are in a gulf, well sheltered, with depths in front of the yard of up to 9 metres, something for example that Viareggio doesn't have. Here we can also hold our vintage boats, for which there is great interest and a lot of work, but, perhaps what counts more, it represents the best possible promotion for us. They were boats built really well, and going around the ports I still see many examples, especially the 16.50. Now these are precious objects. And we always give our boat owners every possible assistance from a technical point of view. Despite the ups and downs of past years, fortunately we have kept Baglietto's technical archive intact, with all the drawings of boats constructed fifty years ago and more. If a customer needs to see how the structures were made, we send them copies of these designs, all over the world. Are you also involved in restoration? No, unfortunately it's a work that we can't carry out, also because most of the boats are in wood, but every now and again, we give a hand to friends. We don't have the specialised labour force for the refurbishment of wooden hulls, but there are many specialised craftsmen. This is the work of a collector. But until now Baglietto has been synonymous with Varazze. What will you do in Varazze? The restructuring of Varazze is necessarily linked to the future tourist port of Varazze. In the new project, we will move back into the port, in the eastern part. When the work begins (the start should be imminent editor's note), our yard will also be refurbished. Therefore we will need a travel lift here too, but a smaller one, since in our philosophy we will dedicate the Varazze yard to the smaller and the faster boats of our range. At Spezia on the other hand, there will be the larger boats, mainly displacing, in steel, etc. Does your space remain the same with the restructuring? It remains as at present. We will only have to rationalise it. It's a yard created more than fifty years ago, for boats constructed at that time: hulls of 12 or 16.50 at the most. The yard had 500 employees and used exclusively internal labour. Today things have changed; you need more space to put the boats and less space for the enormous joiners' shops and the new workshops. Now much of the work is on contract, such as for example the production of the carpentry work for the interiors, the plant engineering, etc. These are small businesses, always the same ones that always work for us, therefore they not only have experience in what needs to be done, but also the flexibility to adapt to the requests and tastes of the customer. Do you have part of a wharf that's all your own? We will have a wharf of about 250 metres, a very important space where we will be able to moor our boats.